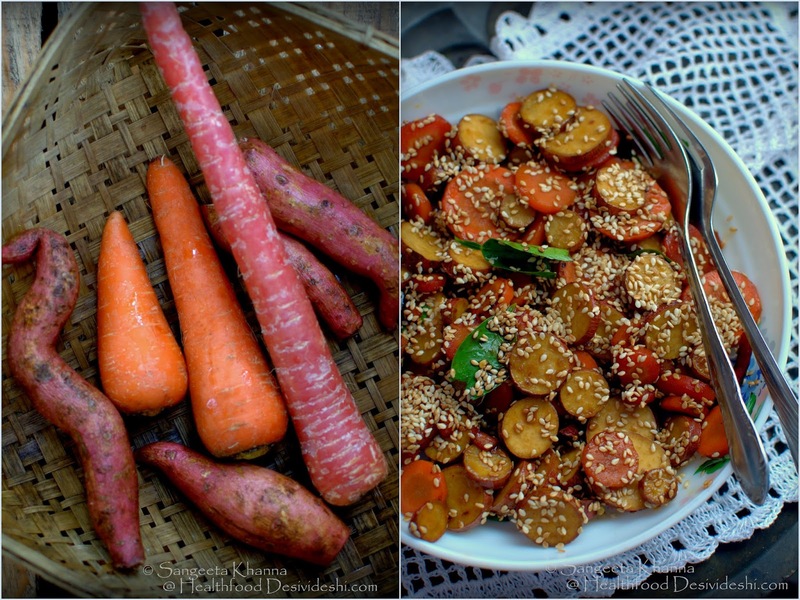 It has been sometime when I had mentioned the 'Farm to Table' meal that we had at Aiyor Bai (close to Hyderabad) and how we dug out baby carrots and sweet potatoes to make a caramelised salad with them. Simple fresh produce was the inspiration for this salad that day and I am amazed at how many people have loved it already. While my friend Bhavana keeps hunting for sweet potatoes in Hyderabad markets, Madhu (the chief farmer at Aiyor Bai) experimented with it too. I myself made this caramelised sweet potato and carrots salad several times after that and took it to potluck lunches twice during the last month and everyone just loved it. The recipe quickly stir fried at the farm was simpler as we did not have more ingredients but the freshness of the vegetables made up for it. Later when I made this salad at home I added a bit of ginger and crushed lime leaves for more aromatic flavours in the salad. 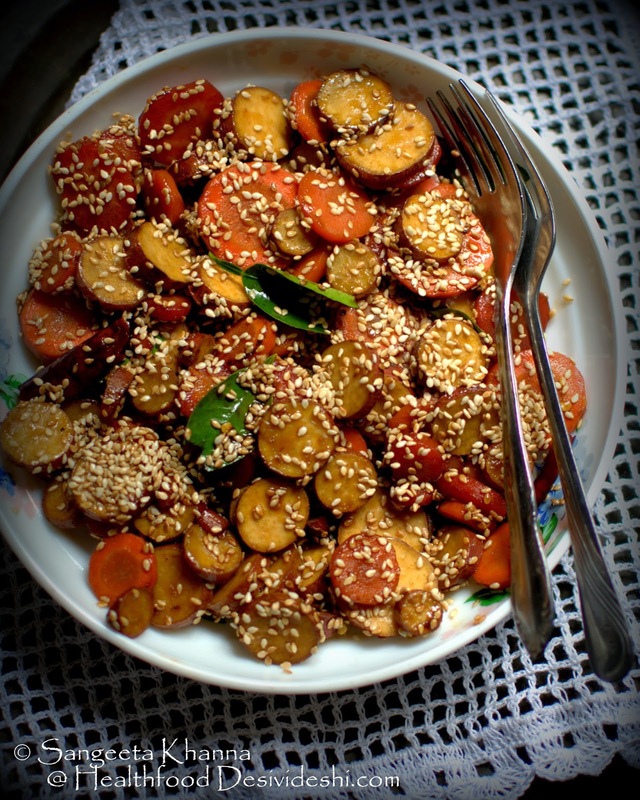 Since I don't have access to such fresh baby carrots here in Delhi, I used a mix of red winter carrots and the orange summer carrots (that are available sometimes in this season too) to bring out a complex sweetness and good colours as well and was not disappointed with the improved recipe. 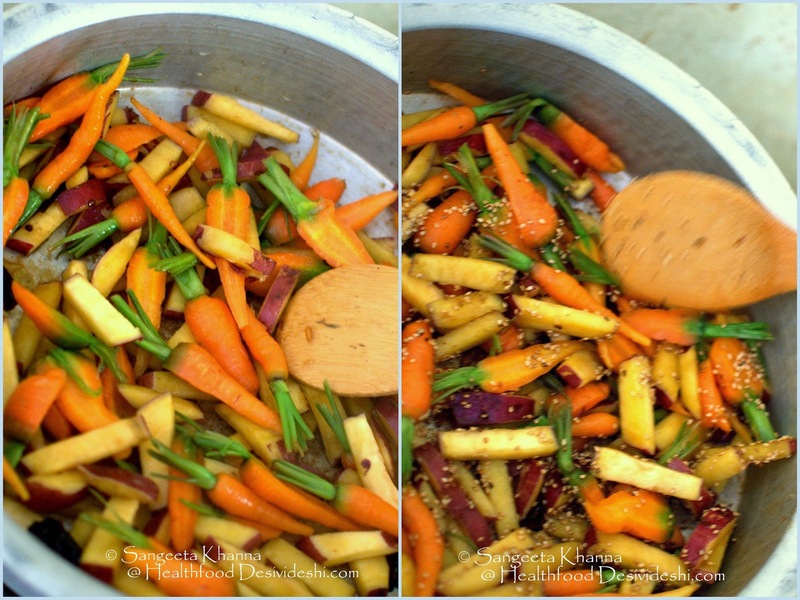 The only precaution one needs to take while making this salad is to use thinner baby sweet potatoes as they slice well into bite size pieces and the cooking time is similar to the carrots. Although we are not cooking the sweet potatoes and carrots in this salad, the are just half cooked to retain the bite and allow caramelisation. I used a huge sweet potato once when I was making the same salad again to take to a family get together and was disappointed with the way the large (mature) sweet potato responded to caramelisation and had a very firm bite when done. Avoid too big and mature sweet potatoes for this salad. Scrub and rinse the sweet potatoes, do not peel them but remove any dark spots from the surface. Scrub and rinse the carrots as well, I prefer peeling them if they have too many crevices on the surface. Sweet potatoes are smoother so no such concern with them. Now take a thick base pan and melt the butter. Add the broken dry red chillies and brown sugar or jaggery and let it melt a little. No need to caramelise this sugar as the slow *caramelisation happens when the sweet potatoes and carrots are added. The brown sugar is added just to enrich the taste and to balance the lime and ginger juices and the chilly heat. Add the ginger juice and lime juice, the torn lime leaves (or a pinch or two of lime zest if using, roasted red chilly flakes too if using)) and toss the salad a bit more. Cook for total 5-7 minutes for this amount if you have sliced the vegetables thin. The slices should be half done and all the juices that release after adding salt should dry up. Empty into salad bowl, sprinkle toasted sesame seeds or mixed seeds and serve warm. You can skip ginger juice if you wish but please do not replace any other ingredient in this salad. You might like to make it just with carrots or just with sweet potatoes too, that is great but the caramelisation, the lime sourness and chilly heat combine really well with the inherent sweetness of these vegetables enhanced by the use of brown sugar. 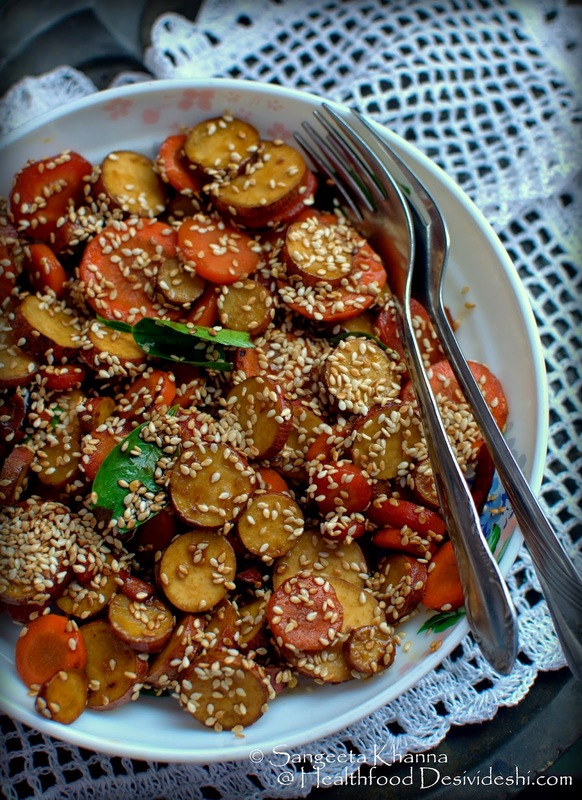 Sesame seeds add texture and more nuttiness, look great too. Some praline could be a good replacement for this but the base flavours of this salad are not meant to be disturbed. I actually went ahead and created a pancake with sweet potatoes having the same flavour mix. I would definitely share the pancake recipe here, enjoy this salad till then. *And since a friend asked about what caramelisation means in this salad when I posted a picture of it on my fb page, I think explaining it here makes sense. In this salad or any other starchy vegetable or fruit (with natural sugar), slow cooking with a little cooking fat results in the caramelisation (browning) of naturally occurring sugars in the vegetable and leads to a sweeter richer tasting end product. While browning of meat involves a chemical reaction between amino acids and reducing sugars at high temperature (called Maillard reaction), browning and caramelisation of vegetables is just a case of Pyrolysis (breaking down of sugars at high temperature) resulting in a nuttier and sweeter taste.